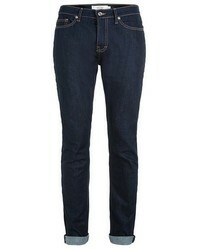 If you're looking for a casual yet seriously stylish look, rock a navy bomber jacket with Topman navy skinny jeans. As well as very comfy, these two items look great paired together. Bump up the cool of your ensemble by completing it with brown suede derby shoes. 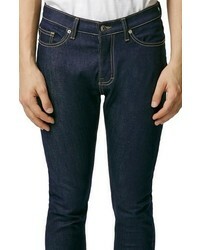 If you're looking for a casual yet on-trend getup, rock a navy denim jacket with Topman Stretch Skinny Fit Jeans from Nordstrom. These items are super comfy and they also look incredible when worn together. Dress up this outfit with black leather brogues. 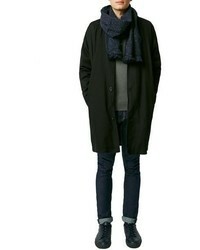 If you're after a casual yet sharp ensemble, wear a navy overcoat and Topman Stretch Skinny Fit Jeans from Nordstrom. As well as super comfortable, these items look great when paired together. Got bored with this outfit? Enter black suede chelsea boots to spice things up. 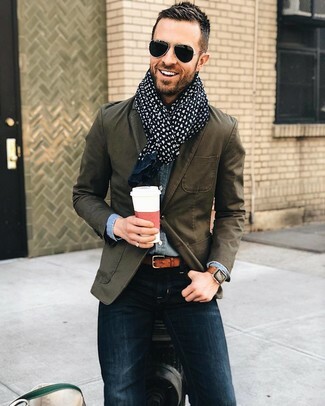 An olive cotton blazer and Topman Stretch Skinny Fit Jeans from Nordstrom are a great outfit that will effortlessly take you throughout the day. 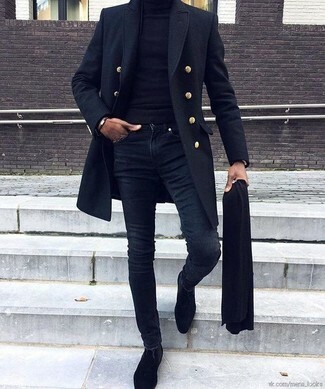 If you're hunting for a casual yet dapper getup, consider teaming a black overcoat with Topman navy skinny jeans. These items are very comfy and they will also look great when worn together. 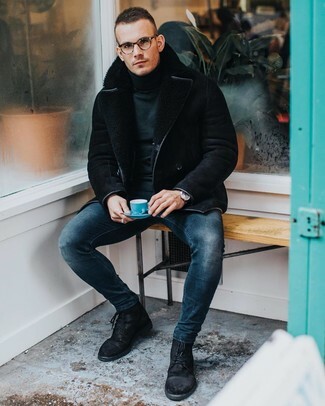 If you're on the hunt for a casual yet stylish outfit, consider wearing a grey overcoat and Topman Stretch Skinny Fit Jeans from Nordstrom. Both garments are very comfy and they will also look stunning when worn together. 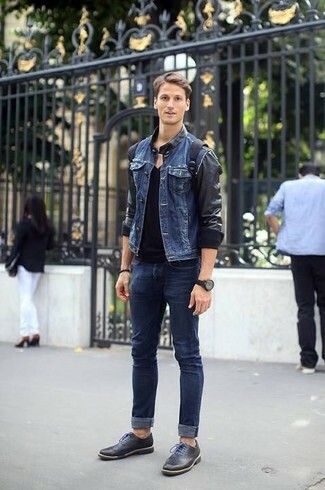 When it comes to footwear, this getup is round off wonderfully with dark brown leather casual boots. Pair a black shearling jacket with navy skinny jeans for a daily ensemble that's full of charm and character. Why not take a smarter approach with shoes and add black suede casual boots to the mix? 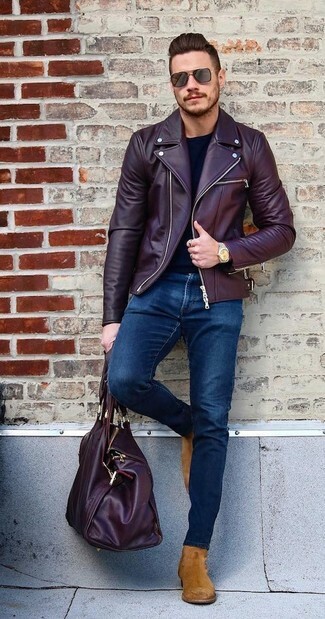 Consider pairing a burgundy leather biker jacket with Topman Stretch Skinny Fit Jeans if you're looking for an outfit idea for when you want to look casually cool. Wearing a pair of tobacco suede chelsea boots is a simple way to add extra flair to your ensemble. 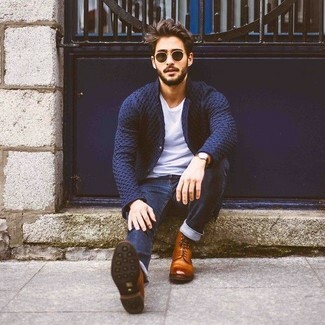 If you're after a casual yet on-trend look, dress in a navy knit blazer and navy skinny jeans. These garments are very comfortable and will look great paired together. Opt for a pair of brown leather dress boots for a masculine aesthetic.